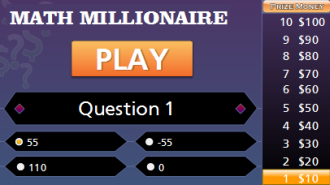 In this millionaire-style game, students will use order of operations to solve math problems involving addition, subtration, multiplication, and division including exponents and parentheses. This is a single-player game that can be played on computers, iPads, and other tablets. You do not need to install an app to play this game on the iPad. How many points can you earn? Play this fun and interractive game to show off your math skills. evaluate expressions with these symbols. Return from Order of Operations Millionaire to 4th Grade Math Games, 5th Grade Math Games,or Math Play.